No, this is not a coincidence. He’s a Blitish brues prayer. – And now, everybody: Crap your hands!! @ Droll not Troll | 4:11 am: No… you not speak English velly wells. It’s ‘Engrish’ prayer. You see, L … like ‘Clicket’! Most of the songs are from his turd album. A musician who’s been flushed with success. He filled the Hollywood Bowl. He was a member of the Lardbirds. Like the famous Beetles, he was from Bitten. Eric Crapton with his second most famous Fender Tratocaster electric guitar, Brackie. I’ll bet it costs a crap ton. Wire my guitar, gentry weeps. Does he look like a locker to you? It’s really a collection cd with songs from a crap ton of people named Eric. 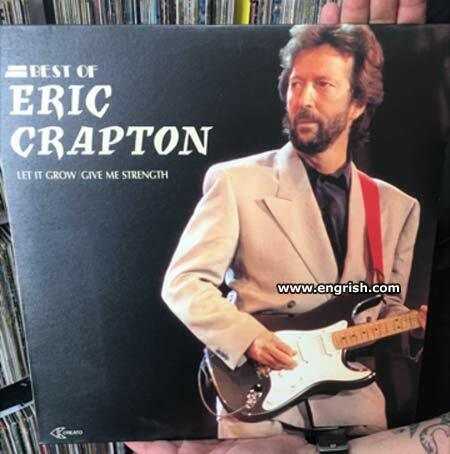 Judging by the album cover, this is the large-headed, small-handed Crapton. Wasn’t he in the Yardturds? He looks like he’s annoyed at the title. The late Jakku Burūsu was lucky enough to not fall prey to bad transliteration of katakana. Nor is still-living Kurīmu founder Jinjā Bekā. And of course, “Rei Daun Sarī” pays homage to two anime magical girls—Hino Rei (Sailor Mars) and Mahōtsukai Sarī (Sally the Witch). Perhaps it was just a little Freudian srip?